Are you building a pitch deck for your startup? Are you trying to impress investors or secure funding? Pitch deck templates are an attractive resource that can help startups in many ways. Some of you might be tempted to use a pitch deck template that’s provided free or low cost because of it’s cost-effectiveness. Obviously money is one of the hardest things to come by in an early stage startup, trust me…we know. The allure of a pitch deck template is strong. A pitch deck template will only get you so far. However, there are definitely ways that a startup can benefit from using a pitch deck template when working to develop their presentation. Here is a step-by-step guide on how you can use a pitch deck template the right way and how the pitch deck examples on the web can provide you with a step in the right direction. There are a lot of resources on the web that can point you in the right direction. Check out companies like SlideBean for their library of pitch deck examples or Guy Kawasaki’s list of Pitch Deck Slides. Or Google’s Pitch Deck Template in Google Slides. These can be a good starting point. We believe the pitch deck is the short form version of a business plan and using the pitch deck templates as a starting point for knowing how to structure your information, is critical to making sure you aren’t reinventing the wheel. If you don’t have a business plan, you don’t really need one. Getting a great pitch deck template for your industry can help to set you down the right path towards doing your due diligence on your company and market before you ask your investors to. What’s that you say? You aren’t asking your investors to do due diligence? Due diligence is what you are asking them to do if you are asking them for funding. Just to respond to your request, the investor has to do some due diligence. Companies that have come before you have already done a level of this. And those that got funded and backed by investors probably went through several internal rounds of development and internal due diligence before actually securing funding. A lot of these companies probably learned the hard way about due diligence. Putting a pitch deck together without looking at your underlying business model, customer traction, and overall risk profile, is a sure recipe for disaster and not getting backed. Investors will see through any half-baked business models and business ideas for what they are: an example of the founder’s laziness and lack of effort to really divulge into their idea. Sure, there are always going to be holes in your business model, but reducing your margin for error on your pitch deck is essential. Even AirBnB had a ton of holes in their pitch deck when they went for funding. At one time they were convinced that the host had to be there for the guest’s stay, and early on intended users to rent primarily air mattresses in someone’s living room. Have you seen them lately? That’s right, they’re dominating their market. But AirBnB wasn’t alone in their endeavors, as they had a great group of mentors and advisors at YCombinator who helped them overcome their initial myopic view of the potential of their business. These reliable sources helped them focus on what mattered, such as getting customer feedback, understanding what makes their company tick, and how they can carve out their own path towards success. So on demo day, and the ensuing rounds of early funding, AirBnB found great success with their investor presentation. When AirBnB presented their pitch deck to investors, the rise of pitch deck use was in relative infancy back then. We definitely believe that it’s worth a look if you have a moment, so if you want to check out AirBnB’s deck see it here. Remember though, just because AirBnB secured funding from investors, it doesn’t mean that you should be using the same pitch deck design that they did. Success does not work that way, sorry guys! As with most investor pitch presentations, securing funding has a lot to do with the startups and the representatives who are pitching investors. It’s all about telling a story and marketing your brand while you market yourselves — you have to be fundable When you combine those three elements together, let me tell you that it makes for one great pitch deck. So let me ask you a few questions: Where are you at with your business? Are you creating an industry or copying one? Are you evolving an industry or are you improving one? The reason I ask is because you need to be clear with all your messaging and business development— you need to let investors know that you are a game changer.  In the investor presentation niche and pitch deck design industry, Pitch Deck Fire is a game changer in the because we teach our entrepreneurs and startups how to make their underlying case the best it can possibly be. Pitch Deck Fire’s entire mission is to be able to take a client’s pitch deck to the next level through compelling storytelling and riveting visual design. In our eyes, the pitch deck is a founder’s gateway to building a better business, getting early marketing done, and securing additional funding to get as much traffic as you can through various marketing outlets. We advise our clients on the importance of getting their business model into top-notch competitive shape so when they hand over the fundamentals to us, our clients can focus on what really matters. Securing funding is no easy task by any means, so that’s why being prepared to fight for your funding is a necessary aspect of success. Nothing ever happens overnight, especially not when it comes to securing business startup funding. The pitch deck is your most powerful tool in this scenario. Another vital aspect of the pitch deck is to emphasize the importance of developing your underlying business fundamentals and your customer engagement efforts. Use a pitch deck template to show you where your industry is at, how far it has come and where you fit into that. If you can’t find a pitch deck template that works, don’t worry. Just build your fundamentals and focus on your sales and customer engagement by figuring out better ways to communicate, provide outreach, and overall interaction. These are the keys to any business’ success and you don’t even need to be in an existing industry to get benefit from all the pitch deck templates that are out there. In fact, there is a great pitch deck template in the book! It’s a canvas that most business’ could successfully follow in order to build out great fundamentals even without ever having seen a pitch deck from someone else. Once you get those common things locked down and have laser focus on your customers. Investors can do a lot with their money with a founder who knows how to build a solid business and keep engaged with his and her customers. Have you ever seen the same commercial used twice by different companies? I’m sure you have, but it wasn’t the same because templates and examples of greatness don’t work the second time around. There are many things that go into a winning pitch and copying other people’s work and taking shortcuts isn’t part of those said many things. We don’t want you to reinvent the wheel, but we do want you to invent the vehicle that takes that wheel and makes it useful. How do you do that? Focus on what you do that is different from your competition. Why do you exist in this world? What would happen if you weren’t here with this idea and this business? It’s not about making a bunch of money and getting out. If it is, you aren’t going to last long in this space. Look at great companies who’ve recently taken their companies through wild success. Are they out? Or are they still there with companies that are worth billions underneath them? Short term exit strategies are for weak minded people and you might get funding with them, but you won’t impress investors in the long-run and you might lose what you built because you got lucky securing funding in the first place. Remember funding is what funding does. If you have terrible performance after raising money initially, you are unlikely to get more down the road. Put your long-term hat on and get serious about how to differentiate yourself. Don’t retire, it’s not about that anyway. That golf game and mai-tai might sound great right now, but you’re going to feel like a bored sack if all you did this for was money and to sell it. Why does Jeff Bezos still run Amazon? Bill Gates, Mark Zuckerberg? Warren Buffett? Because this is about making a difference, not making a buck. Money comes to those who make a difference. Difference makers aren’t sitting on a beach because they have the drive to make the world better like they want it to be. And they are rich because of that from day one. You need to focus in on how you are making a difference today. This will really help you when it comes time for fundraising and gaining customer traction. You have to get out there and get wild about what you are doing, why you exist. We exist to make this better and here’s how we do it differently and here’s how we are making this world better. Don’t copy Dollar Shave Clubs Viral Video. It won’t go viral again. Copy their underlying desire to be different and make it better for them and you. They are still doing this today, long after their video’s popularity has worn off. Your long-term plan needs to be about making a difference and through that you will make everyone rich. Now write some of that into your base copy from the first section and get back out there and talk to your customers. What is going to make their life better today? Our customers wanted a great pitch deck that doesn’t cost a lot. So we went crazy finding the best team, creating the best tools to get it done and then building additional scale so they could take what we built for them and actually use it to get customer traction through additional marketing. We are crazy about great marketing and we want you to be super successful. We know the true cost of getting your friend to do your pitch deck and copying someone’s template library. The cost is so high to choose that option, believe me. We know that every client that works with us is getting the best thing they could’ve bought with a long-term design partner and that we are an entity that can help them keep costs down and focus on what they are good at. We know the startup world would be worse off without us because we are taking companies to the next level everyday. And we stay with them to help with websites, sales processes, strategy, and all their marketing design needs. If you are our customer I can guarantee you, you are already better off than trying to hack your way through this with Fiverr. Don’t worry about pitch deck design yet, just focus on getting the fundamentals down pat and making sure the underlying business structure and customer engagement plan is clearly articulated. What kind of traction do you already have? That’s really important to understand early on and grow as you build out this base content of the pitch deck. At this point, we’re not talking design, story or anything else, but becoming more clear on the fundamentals and your customer base. From there, you can build the language into some kind of basic template. It can even be a word document. Look for articles about the only 10 slides you need if you are having trouble. Those are a great starting point. You can also check out the business model canvas. It will help you see all the parts of the business and how they fit together. Get all that info out onto paper in whatever format makes the most sense. Talk to your customers more than you already are. It’s this behavior that will set you up for success more than any other. We know it’s hard, so get started today. Communicate that effort and any traction you are getting from it in the base content you are building for your pitch deck. See how we are already past the template? If you are tempted to use a pitch deck template with what you’ve already built, you are about to make a mistake. Don’t use the pitch deck template or any pitch deck examples for anything but basic understanding of what you are doing and getting started. It should only be used for talking more about your business with your actual customers. Find your passion and improve your customer game by knowing your value. Use the content we’ve built so far to make sure there aren’t any gaps. Make sure you are iterating your message with customers involved. You can do a lot more with them than without them. Knowing your customer and what makes them tick is one of the MOST IMPORTANT things to do as a founder and business leader. Get that gap analysis focused on better ways to get traction and get out there and close the gap. Translate your effort into the base content that we used all those pitch deck templates to start. Am I talking to my customers enough? Am I realistic about the money I’m asking for ? Would I invest or buy-in on how I’m planning to spend money? Would an investor? Once you get all those questions answered you’ll be much more inclined to talk to investors. If you are a gamer, then you can probably understand the analogy of showing up to the final boss battle with an underdeveloped character. Yup, that’s right it’s the same in business. And once you get defeated for being unprepared, you will have to restart the game and do it over again if you aren’t careful. So do it right the first time and lets get super powered before we go knocking on the funding door. How do you power up your business before facing the final boss battle of this level? Internal due diligence. Everything we’ve taken you through so far should have you powered up and ready to go. Customers are your hearts, and a great business model is your strength and overall stamina. And knowing how you got here with passion and experience is how you are going to win against something that initially seems huge, scary and out of your league. Well, that’s it for today! But, we advise everyone to stay tuned for the continuation of our series of blogs dedicated to helping startups and entrepreneurs navigate the rough waters of securing investment funding. Our next article is going to be a real doozy, a must-read for those looking to understand the mind of an investor! We’ll be continuing this series with a post about how you can survive investor due diligence and live to tell the tale. So stay tuned everyone! If you found our post educational, please visit our additional resources that are available on our website. We look forward to hearing your thoughts in the comments below and remember: get your fire with Pitch Deck Fire. We don’t only build pitch decks, we build futures.